Pasta e Fagioli Soup just hits the spot; especially now that the weather is starting to cool off. Invite someone over and enjoy some soup together! I made this Pasta e Fagioli Soup the other night; however I doubled the batch. It turned out to be a good thing that I doubled it, as my married kids showed up hungry and had some hungry kids with them! It is always a good thing to have more than you need. You never know who might turn up. I have made dinner a few times in my life and people have showed up. I always ask myself what can I add to go with the dish that I am making so that everyone gets enough to eat. You could always whip up a batch of pumpkin chocolate chip muffins. This is my easy go to recipe, and we all love it. It can go with any meal and there are sometimes some left for breakfast. If you want to be a little healthier, you could add raisin in place of the chocolate chips, but chocolate chips are my favorite. Through the years, I have learned to make plenty of food, so when my children brought their friends home, I could say “there is soup (or whatever I made that day) in the fridge”. I do like having food on hand, because someone is always hungry. I even had enough soup to take to my neighbor that is a widow. You will enjoy this recipe. 1- I like to buy hamburger in bulk, and then I come home and cook it on a cookie sheet in the oven for 30-45 minutes. 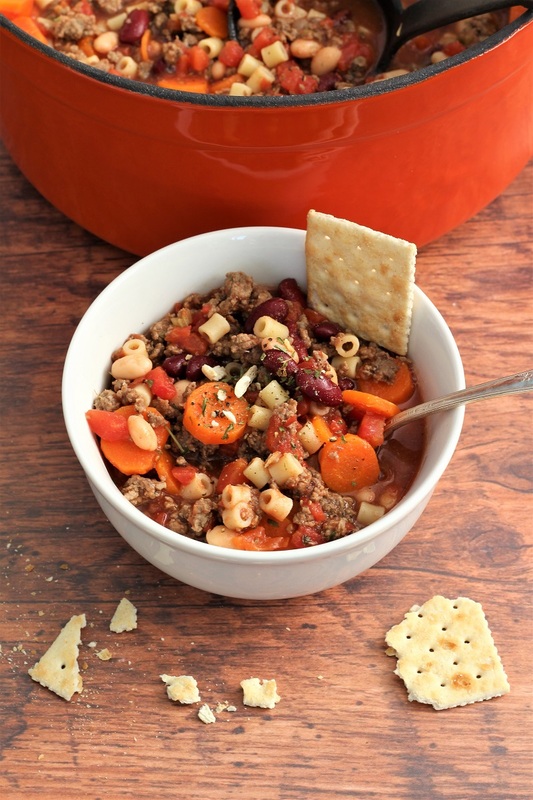 Then I freeze it and when I need ground beef for a recipe like this Pasta e Fagioli soup it makes it a little quicker to make. 2- I love all of the blends of the the wonderful spices. If you do not have marjoram, add just a little bit more pepper and thyme. 3- If you do not want to cook your pasta separate, put it in the pot about 20 minutes before serving and add the beans about 10 minutes before serving. Do not over cook your noodles or they will be too soft. 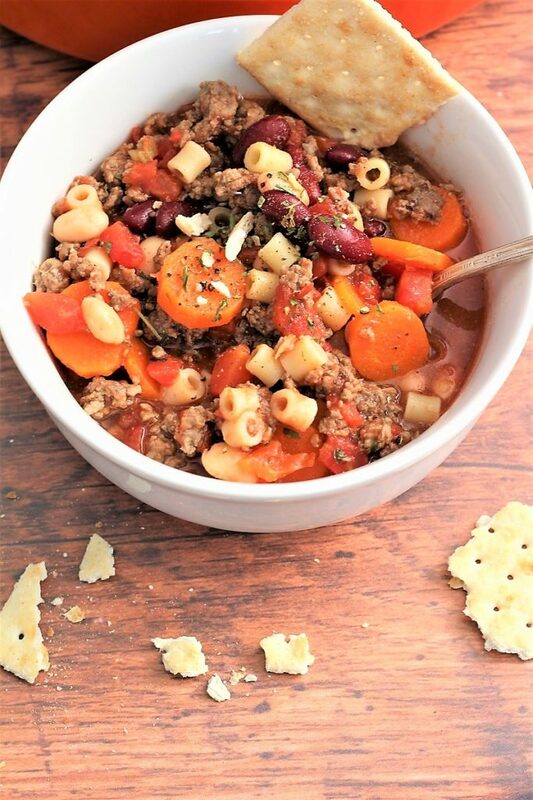 I hope that you get a chance to make Pasta e Fagioli soup and remember that it is a quick meal in a matter of minutes. It is really nice when you can add a few cans of beans and tomatoes and in just a few minutes have a nice pot of soup. Heat olive oil in a a large skillet, add ground beef and brown. (Depending on how much time you have, you can cook this in a slow cooker or a large heavy pot). Drain ground beef and set it aside. Saute onion until translucent, (about 4 - 5 minutes on medium heat) add garlic and saute an additional 1 minute, and then remove from heat. Cook broth, carrots, and celery over medium heat; cook just until tender. Reduce to a simmer and add tomatoes, tomato sauce, oregano, thyme, basil, marjoram, bay leaves, salt, pepper, ground beef, onions and garlic. Cook ditalini pasta according to package directions, just until done; (do not over cook as the soup is hot and it will keep cooking and go too soft). About 20 minutes before serving add the beans. Right before serving add the cooked pasta. One half hour before serving, add drained beans and pasta (uncooked). If soup is too thick you can add more broth. 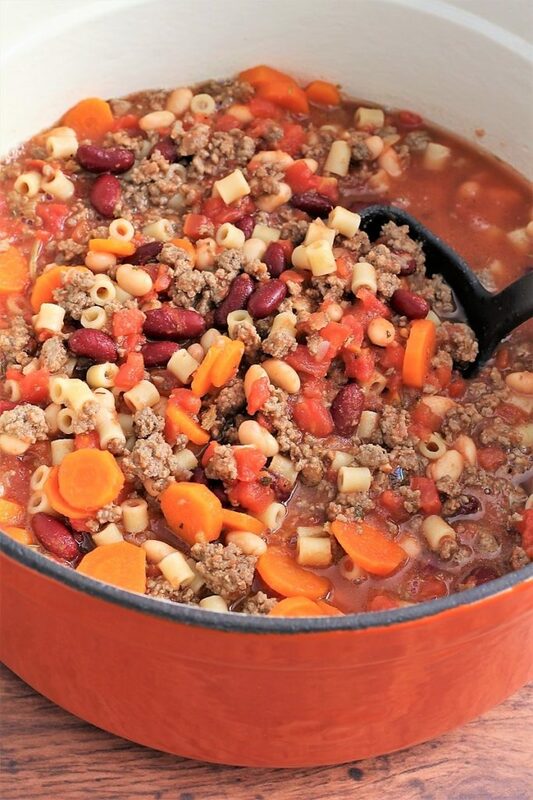 After adding the ground beef and onion to the slow cooker, add the rest of the ingredients, except the beans and pasta, (they will go too soft) and cook on low for 6 - 7 hour or high 3 - 4 hours. Serve while nice and hot. Optional: Sprinkle with Parmesan or Mozzarella cheese. Thank you for all the fun ideas!! And thank you for stopping by! I have never tried this soup before but it looks so hearty! I looooove soup. Will definitely have to make this! Wonderful, I hope you get a chance to try it and that you love it. I hope that you are doing well and staying warm!